The CWT/ABT is America's largest non-profit organization devoted to the preservation of our nation's endangered battlefields. It has saved over 50,000 acres. The Trust also promotes educational programs and heritage tourism initiatives to inform the public of the war's history. The CWDF has conducted several programs for the Trust’s annual conferences and teacher institutes and the CWDF was named the Trust’s Reenactment Unit of the Year in 2011. This $1,000 donation will continue our designation as a member of the CWT’s “Color Bearers” donor group. With the cancellation of the Cedar Creek Reenactment in 2018 due to concerns for the safety of visitors and reenactors, the CCBF has lost a large portion of its funding to preserve the battlefield. The Heater House, located on the battlefield, is in need of restoration and the CWDF donation will help with this project. The CWDF has conducted balls at the battle reenactment in the past and has assisted with programming at Belle Grove Plantation. Our donation to the Archives will be used to conserve Confederate General McCausland’s order to spare Reverend Kennedy’s house next to the Falling Springs Presbyterian Church during the burning of Chambersburg. The document, dated July 29, 1864, has excellent provenance, being donated to the State Museum in 1938 by the Reverend Kennedy’s daughter in law. The piece was displayed in 2014 to commemorate the 150 anniversary which was when State Archives staff realized its dire condition. For several years, the CWDF has conducted a ball as part of the commemoration of the Chambersburg Raid. 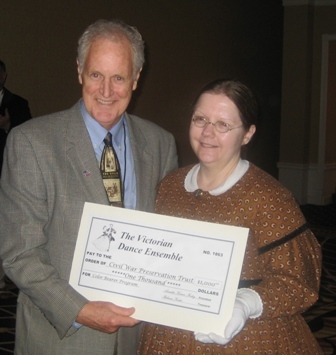 The CWDF/VDE uses the proceeds from its performances and sales of its dance instruction DVD to support various historic preservation and education programs. We have also donated thousands of dollars in services and thousands of hours of volunteer time. Through 2018, the CWDF has made direct cash donations of over $60,000. When combined with fund-raising balls and events we conducted for other organizations, we have now helped to raise over $275,000! Friends of the Monterey Pass Battlefield, Inc.
Stonewall Jackson Headquarters in Winchester, Va.
Jim Lighthizer. 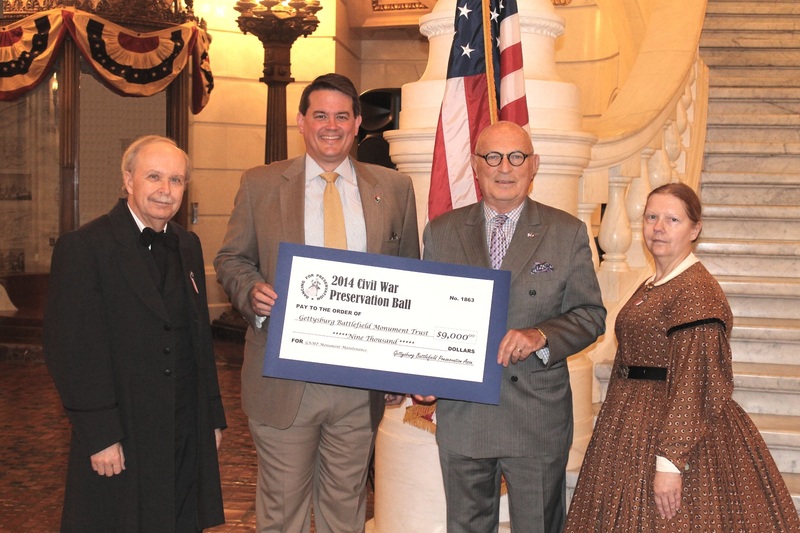 President of the Civil War Trust, accepting a donation from CWDF President Annette Keener-Farley. Over the years, the CWDF has donated over $14,500 to various CWT projects. The CWDF donated money to the Camp Curtin Historical Society for the erection of the Gen. Albert Jenkins Monument in Mechanicsburg, Pa., marking the northernmost advance of the Confederate Army during the Gettysburg Campaign. Gettysburg National Military Park Superintendent Ed Clark (second from left) accepts a check from VDE Dance Master Larry Keener-Farley, State Repre- sentative Harry Readshaw and CWDF President Annette Keener-Farley. The CWDF has supported the Pennsylvania Gettysburg Monuments Project (popularly known as “Readshaw’s Raiders”) since its founding by conducting fund-raising dance classes and balls. Over the years, these events have raised over $100,000 for the restoration of monuments at the Gettysburg National Military Park. Copyright 2019 Civil War Dance Foundation. Do not reproduce any text or photographs from this website without permission. 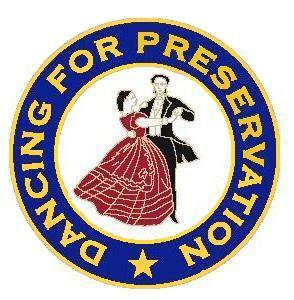 The Civil War Dance Foundation is a Pennsylvania nonprofit corporation, recognized by the U.S. Internal Revenue Service as a Section 501(c)(3) not for profit charity. The Foundation is also registered with the Pennsylvania Department of State, Bureau of Charitable Organizations. All contributions to the Foundation are tax deductible to the extent allowed by law. The organization's exempt purpose is to promote and advance educational, cultural, preservation, commemoration and performing arts programs related to the Civil War and Victorian eras.